Has anyone noticed the amount of “Help Wanted” signs posted lately? It seems that a new sign goes up almost daily and many stay up for quite a while. Unfortunately, our current labor shortage is not expected to end any time soon. While the precise number of projected job openings versus available talent varies based on the type of economic projection model used, most people agree that the largest factors at play are the aging workforce, the large wave of retirements from the Baby Boomer generation, lower birth rates and fewer people migrating to the region. As one of Wisconsin’s 11 workforce development boards that work on employment and training solutions for our region’s employers and job seekers, we deal with this issue every day. We are increasingly working with businesses on creative approaches to incorporate into their talent strategy to help them overcome this challenge. Along with culture, branding and recruitment best practices, one of the first recommendations we make is to consider hiring individuals from what is often referred to as “nontraditional” populations. Each business or industry sector may have different definitions for “non-traditional.” For predominantly male industry sectors, this could include making a concerted effort to reach female candidates. For businesses that tend to hire talent fresh out of college, this could include hiring mature workers who are on their second career. Other “non-traditional” populations may include veterans or people with barriers to work, such as individuals with disabilities, ex-offenders and more. The benefits of hiring from outside your traditional candidate pool are numerous. A diverse workforce brings diverse ideas, skill sets and perspectives, and often increases creativity. Not only does it help with recruitment efforts, it can help build a name for your business in the community as an inclusive and innovative employer. If you are interested in learning more about non-traditional hiring, read on! You can also feel free to contact me at lcatherman@wctc.edu. I would be happy to assist you and/or connect you to the local experts for each group. By exposing students to a variety of career pathways early on, such as manufacturing, construction/skilled trades, health care and information technology, students discover their interests and aptitudes. Students can then develop a career plan, whether that means going to college or starting their career right away. While they’re going through this career exploration, they can be employed in entry-level positions at companies in those industries. This sets them up for success.Today’s students need exposure to real-world careers. As the current workforce is aging, it is time to prepare the next generation of hard workers for industries that are integral to our economy. DWD helps employers recruit college interns on WisConnect, a free online resource that matches college students with internships by location, college major and key skills. GPS Education Partners brings business, manufacturers, education and community together to provide meaningful opportunities for high school students that want more than what a traditional classroom can provide. The Alliance partners with educational institutions to expose students to all the career opportunities in Waukesha County. DVR works with high school students to provide a smooth transition from school to work and community services. The Department of Workforce Development’s Youth Apprenticeship program integrates school-based and work-based learning to instruct students in employability and occupational skills. Students are simultaneously enrolled in high school and employed by a participating employer. According to Opportunities, Inc., an organization that works with people with disabilities, eight out of 10 individuals with disabilities want to work and are available to work in the United States. Having a workforce development strategy that includes people with disabilities benefits individuals, employers and the community as a whole. Many high-demand jobs are often entry-level positions that lead to high turnover. According to Opportunities, Inc., the traditional employee turnover rate is about 45 percent in most entry level positions, while the turnover rate for an individual with disabilities is only 8 percent. Organizations who provide training and placement services for individuals with disabilities support employers by providing dependable, highly motivated employees, reducing turnover rates and creating more inclusive work environments that lead to better business outcomes. People with disabilities can and do explore careers options that meet their skills and interests. Examples of successful career connections include retail, janitorial, manufacturing, hospitality, restaurant, trades, finance/accounting, technology, food service, health care and more. Easterseals continually strives to develop innovative and creative programs to meet the unique challenges of individuals with disabilities and their families in the local communities we serve. Easterseals engages and supports employers by providing training and placement services for individuals with disabilities to create more inclusive work environments. Goodwill provides training, employment and supportive services for people with disabilities or disadvantages who seek greater independence. Goodwill also provides onsite assistance with job coaches who offer long-term support to employers who hire people with disabilities. Opportunities, Inc. is offers comprehensive vocational training and employment and outreach services for individuals with disabilities. Opportunities, Inc. specializes in meeting the needs of area employers, utilizing an untapped resource that statistically is more committed and performance-minded than the average worker. The Genesis program at St. Coletta of WI develops, supports and transitions adults with disabilities to independent living and community employment opportunities. Job developers and job coaches in the Genesis Program strive to work with companies in the healthcare, manufacturing, technology and food service industries. DVR is a federal/state program designed to obtain, maintain and advance employment for people with disabilities by working with DVR consumers, employers and other partners. Wisconsin Independent Learning College serves individuals with autism, ages 18-30, by providing daily living skills, prevocational and vocational training. We pride ourselves on our ability to “job carve” in order to create meaningful employment opportunities based on an individual’s skills. Individuals who resettle in our area can make wonderful additions to a company. While some may face language barriers initially, they have a strong skill set, willingness to learn and appreciation for opportunities. Immigrants and refugees can work extremely in industries such as manufacturing, health care, retail, service and more. Settings where bilingual skills are an asset can be a great fit as well. Catholic Charities’ Refugee Resettlement program helps resettle refugees into local communities. Securing long-term, full-time employment for refugees is the goal and Catholic Charities is the liaison between the employer and employee to ensure a successful transition into the workforce. Centro Hispano Milwaukee serves the immigrant, refugee and economically disadvantaged, assisting immigrants and refugees with filing documents with USCIS and providing instruction in citizenship preparation and English language learning. Participants can access education and digital literacy to help them prepare for and/or function in employment. James Place Immigration Services helps immigrants, including refugees, with legal advice about government paperwork so they can stay, obtain needed immigration benefits and work legally in the United States. They help these individuals find work, providing assistance with computers, writing resumes, filling out applications and more. One of the top reasons why companies can’t hire enough workers is they can’t find enough people to pass a drug test. However, according to the National Survey of Drug Use and Health in 2015, only one in 10 individuals suffering from addiction receive any type of treatment. Addiction and unemployment fuel one another—we need a clear path to community wellbeing. By hiring individuals recovering from substance abuse, we can improve the quality of the workforce, reduce welfare dependency, increase economic self-sufficiency and enhance productivity and competitiveness. Apricity provides those impacted by substance use disorders a full spectrum of care including treatment, employment and support services in a safe, progressive recovery community. CleanSlate’s outpatient, medication-assisted treatment center in Waukesha serves people struggling with the disease of addiction. More and more industries and employers are broadening their recruitment pool to include ex-offenders. This is not only the result of a tight labor market but also due to the many successes that other businesses have experienced. Educational programs and employment-related training programs in the justice system have increased greatly in recent years due to state and federal investments. Many ex-offenders leave the system with in-demand skills, a strong desire for stable employment and a willingness to work hard. In some cases, hiring incentives are available to employers through the Federal Work Opportunity Tax Credit, fidelity bonding and other grant-funded resources. Contact WOW to learn more. The Joseph Project is a career placement program that provides resources, education, support and transportation to job seekers in Milwaukee. It is a voluntary program, designed to assist in locating and maintaining permanent employment at manufacturing companies in southeast Wisconsin. Mindful Staffing Solutions helps men and women who have been incarcerated build a better and brighter future. They teach skilled trades to people and help them find employment in the construction industry. Windows to Work (W2W) is a voluntary re-entry program designed to help individuals who are about to be released into the area transition from incarceration back to the community successfully. The W2W Career Planner serves as an advocate and provides pre- and post-release services to address criminal and addictive behavior/thinking, financial education, accessing community resources and employability skills. Wisconsin employers understand the workforce value of veterans, and many businesses actively recruit veteran applicants for their work ethic and skills. The transition from military to civilian life may be a significant adjustment, especially for those veterans with barriers to employment, such as a service-connected disability or other health-related issues. However, veterans leave the military with transferable skills that are highly desired by civilian employers. Employers seek military experience to build an innovative, resourceful and reliable workforce. It is important to note that there is an equivalent civilian job for nearly all military jobs. Examples include: accountants, attorneys, computer technicians, equipment operators, healthcare professionals (doctors, nurses, medics, technicians, etc. ), mechanics, procurement specialists, welders and more. 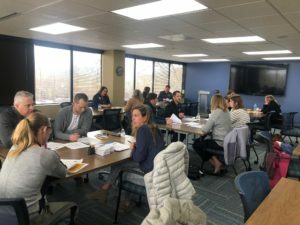 DWD – Office of Veterans Employment Services helps connect veteran talent with Wisconsin employers to fill good-paying jobs with family-supporting wages. The website also interfaces with JobCenterofWisconsin.com, offering over 20,000 veterans with posted resumes and integrates O*Net’s Military Crosswalk for identifying connections between military and civilian job skills. Through its Employer Connect Program, La Casa provides a full range of employment services and connects well-qualified individuals to local employers. Employer Connect works to cultivate long-term relationships with employers by assisting them in recruiting, screening, and post-hire skills training. The Board works in collaboration with local elected officials, economic development corporations, businesses, and the community to address macroeconomic workforce issues in the 3-county area. The Board offers a variety of demand-driven programs and services to businesses and job seekers. Through the office of Life Skills Counseling, The Women’s Center seeks to support survivors of domestic violence, sexual assault, child abuse and trafficking in all aspects of the job search. In addition to providing personal counseling/advocacy, we host a series of workshops throughout the year to support building the soft and hard skills necessary for job obtainment and retention. The Workforce Development Center is a lifelong resource to all job seekers, both present and future, and a means to help businesses meet their short- and long-term workforce development needs. The Center houses numerous workforce development programs from job training and employment to FoodShare Employment and Training to Wisconsin Works, and more. This story was originally published in our June 2018 Accelerate Waukesha County magazine.